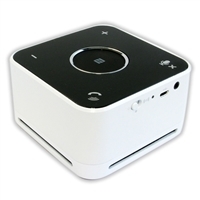 Conference Mate (WHITE) NFC Portable Wireless Bluetooth Speaker. Professional sounding phone calls when paired with your Bluetooth device and you'll love how it plays music when paired with your A2DP Bluetooth devices. Dual Omni-Directional Mics assure you will be well heard on far end and sleek upward design for a full acoustic sound in every room.